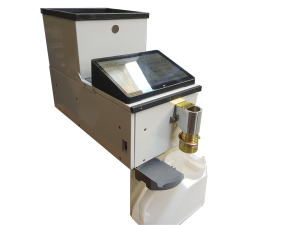 The Trojan Plus Coin Counter/Dispenser is a high quality, high speed machine capable of dispensing and counting large volumes with ease. Fast, quiet and accurate, the Trojan Plus comes with a Printer option, separate Customer Verification Meter, its own Remote Keypad, and a host of other features all at an extremely affordable price. Designed for coin clearance and cashiering. The software is extremely user friendly. Rugged, durable construction is the Trojan’s keynote and it is designed to handle the rigours of everyday use. Built to give you years of trouble free service the Trojan Plus even comes complete with a stainless steel hopper. The Trojan Plus is manufactured to VFJ’s own strict specifications and is covered by VFJ’s famous 12 month warranty for your peace of mind. High Speed, High Quality, High Satisfaction!